August 15th 1947. Though most of us were not around to experience the euphoria of being an independent nation finally, the historic date is imprinted in our minds and always will be. The same goes for Pandit Jawaharlal Nehru’s “tryst with destiny” speech at midnight on August 14th. Now, if one were to imagine a slice of euphoria dating from a few hours before that famous speech, declaring India’s independence, served up on our present dinner table, how incredible would that be? That is the brilliant concept curated by the Taj group of hotels, in a befitting tribute to the 70th year of India’s freedom. 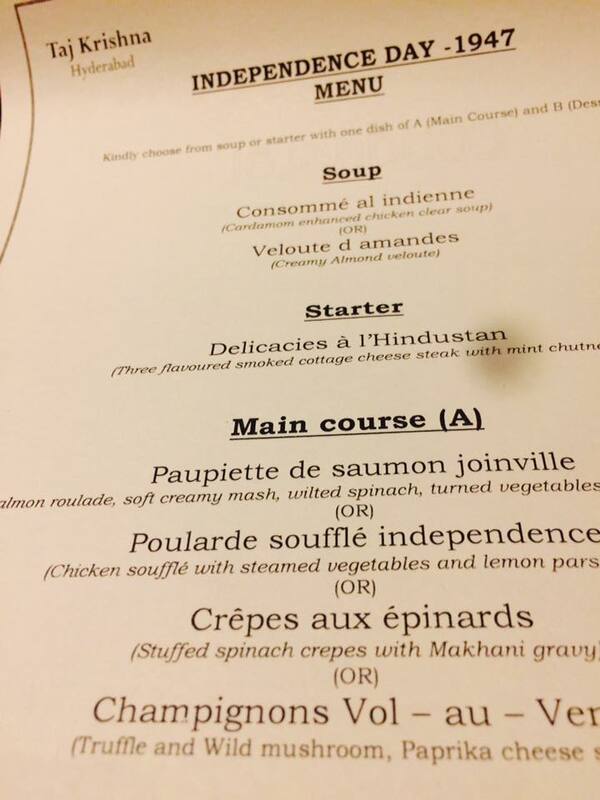 The three-course French haute cuisine dinner menu (rationing was rampant at the time) served at Taj Mahal Palace, Mumbai to cabaret entertainment and merriment on the night of August 14th, adapted and recreated to be a four-course menu Independence Day promotion in 2017 across Taj properties in the six metros: Delhi, Mumbai, Kolkata, Pune, Hyderabad and Chennai. I was, obviously, elated to be invited to a dinner preview table at Encounters, the coffee shop of Taj Krishna to experience the same. 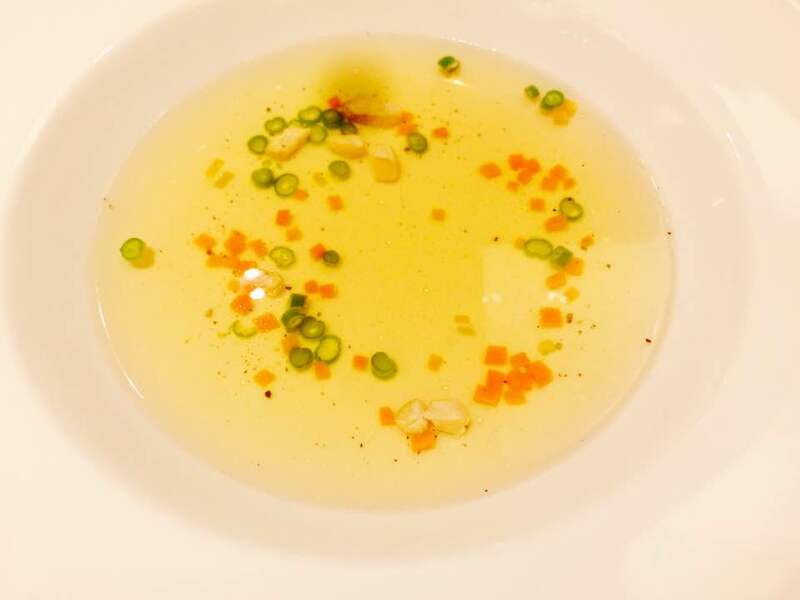 For soups, there were two choices of Consomme Al Indienne (cardamom-enhanced chicken clear soup) and Veloute d Amandes and I chose the former. The soup was light, flavorful and the carrots, beans and made for the national colors of the flag, so to speak. And guess what? Since my neighbor at the table was vegetarian and an ex colleague at that, I managed to try some soup from her bowl as well! Truth be told, I loved the almond soup better because it was creamier and more full bodied in a nourishing way. I also loved the croutons which had an almond inside each! 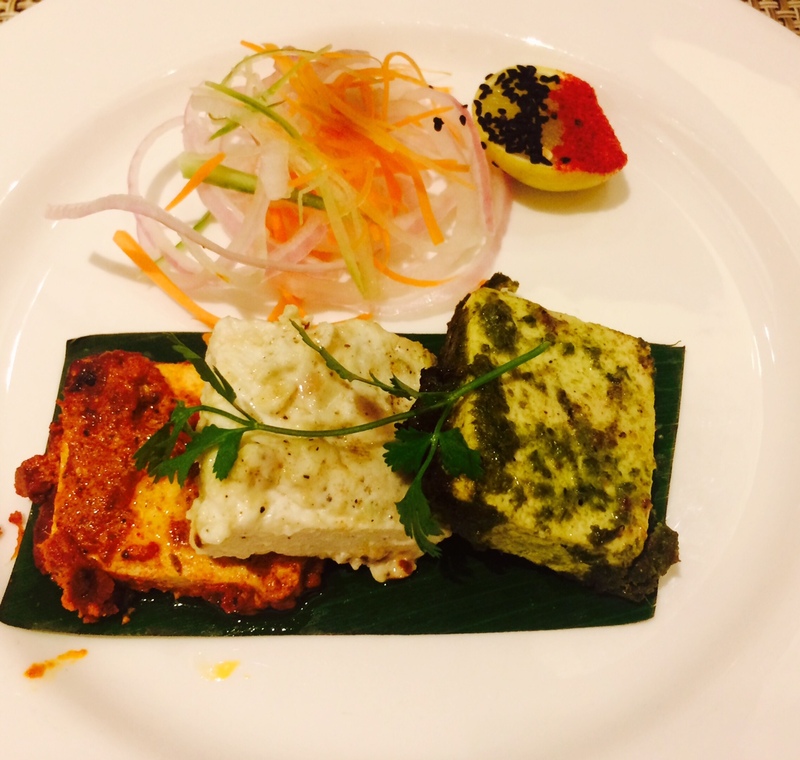 For starters, there was a single choice of Delicacies a l’Hindustan: Smoked paneer chunks in three different marinades, and this was truly spectacular. One was in a mint chutney version, tangily-addictive, but I also liked the lighter creamier ‘malai’ one as well as the red-chilli one, all of which were soft and succulent and redolent with their distinct flavours. 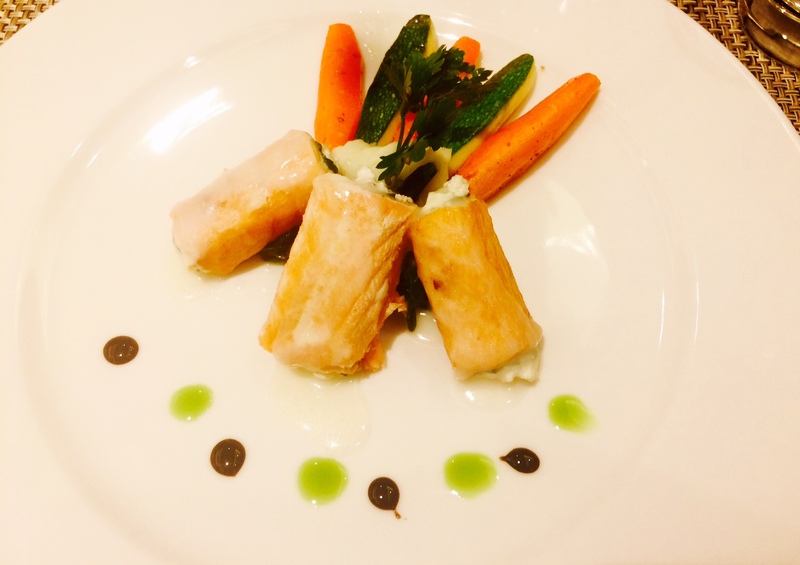 In main courses, I chose a Paupiette De Saumon Joinville, salmon roulade with soft creamy mashed potato, wilted spinach, turned vegetables and Joinville sauce. The roulade was perfect, and the vegetables were the perfect combination to go woth the fish. Vacherin de Peches Liberation or peach-infused apricot sorbet was next, and it was served in two meringue shells. This was definitely one of the highlights of the dinner. 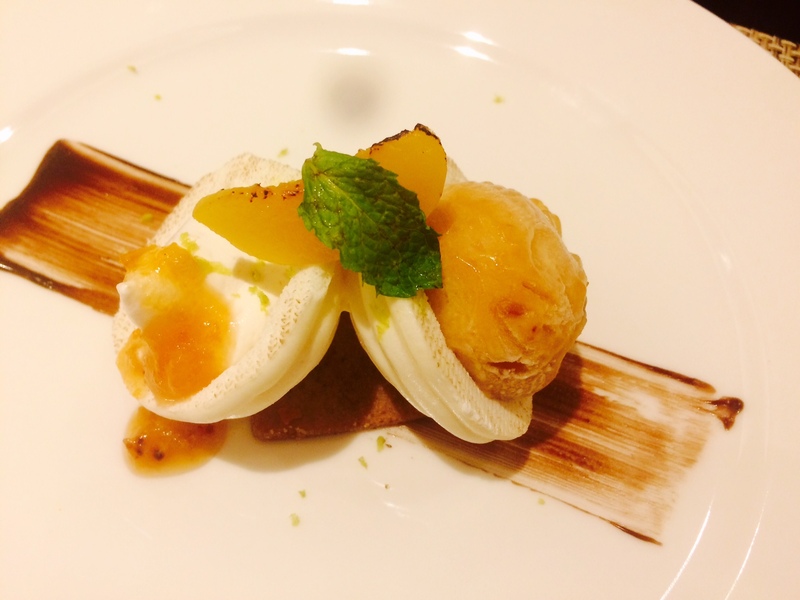 The apricot sorbet had the lovely texture and aroma of apricot and the poached peach in the other half provided the right tartness. 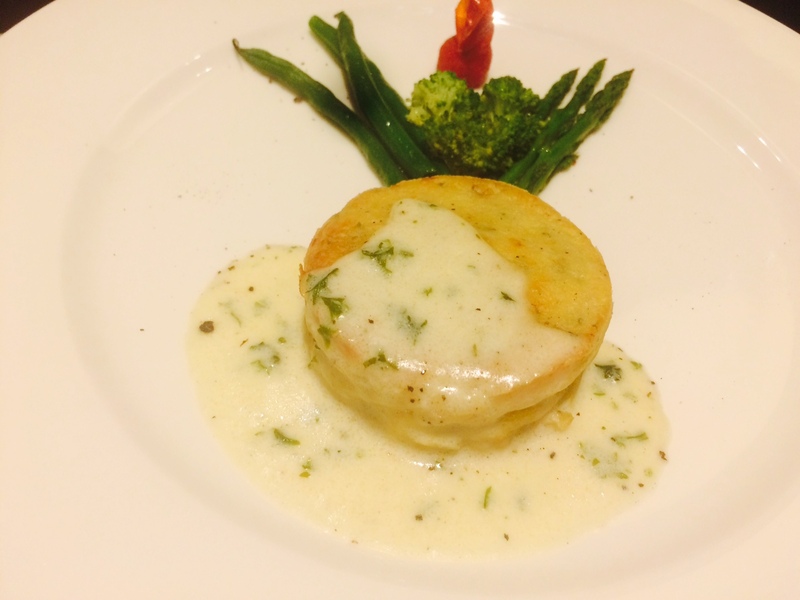 The dinner is available at Rs 1947 (plus taxes) for dinner at Enocunters, Taj Krishna until tonight ie August 15th.